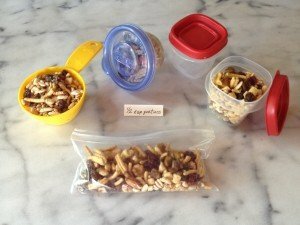 It’s time to update a post from a few years ago about my homemade trail mix. I’ve been making this for years and if you’re a client (or friend or family member) or if you have attended a talk I’ve given, you likely received a bag (or three) of Neily’s Rockin’ Health Trail Mix. I came up with the idea at the request of a client looking for a healthier afternoon snack, something other than plain nuts. One way to dilute the caloric density of nuts is to mix with a less caloric product. Trail mix is slightly better (than nuts) with its added dried fruit but still pretty dense in calories. Watch this video or read the transcript of a label reading demonstration. Look for THIS Kashi GOLEAN. No Crunch or Crisp or anything else. Just good ole’ Kashi GOLEAN. 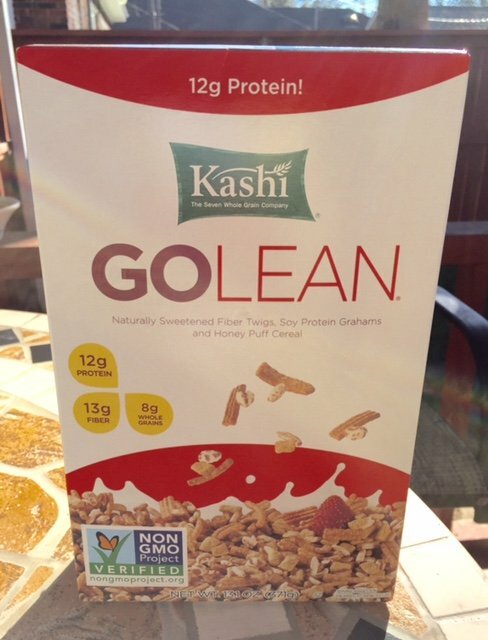 A key ingredient is one of my favorite cereals—Kashi GOLEAN Original. Make note this is the ORIGINAL Kashi. There are now numerous GOLEAN cereals higher in calories and added sugar. Like many popular products, brand extension is common. Unfortunately, Kashi has gone that route. Personally? Not thrilled about the extra sugar in some of the other GOLEAN cereals. I just looked at the nutritional information for sources of sugar in one of the brand extensions GOLEAN Crunch—brown rice syrup, dried cane syrup, honey. 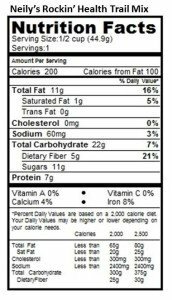 If you look at the nutritional panel there are 13 grams (just over three teaspoons) of sugar in one serving and 190 calories. But get this, a serving is 3/4 cup. Compared to the original Kashi I love where one serving is 1-1/4 cup, 8 grams of sugar and 180 calories. To compare apples to apples (or Kashi to Kashi) and doing the math, a 3/4 cup Original would have 108 calories and 4.8 g sugar. Kashi, what’s up with that? Here’s my recipe. For a ½ cup serving it’s 200 calories versus 400 calories for a ½ cup serving of nuts. Plus it’s high in fiber as well as protein. Mix together and portion out 1/2 cup servings. Makes about 18 servings. Although it does not need to be refrigerated, I like to store in fridge or freezer—tastes great cold! Yes, I do use salted sunflower seeds. It adds negligible sodium yet adds a nice sweet/salty taste. Variations: Use all raisins or all dried cranberries and any combination of the nuts you prefer. 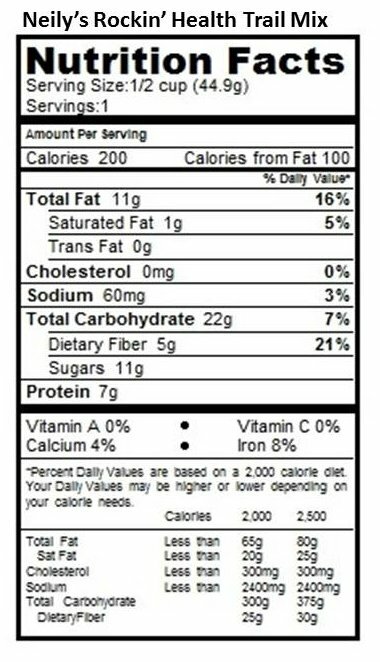 Just make sure to keep those portions accurate to keep the nutrition information correct. I’ve been using sunflower seeds more often only because I make so much to give away. It’s more economical. Like any healthy snack, portion control is key! Here are a few examples of how you can keep portions in check. And you’ll need to—this is good stuff! Measure out 1/2 cup servings and keep them in reusable plastic containers or use little snack baggies. Note: I have no affiliation with any products or brands mentioned in this post. If I did, I would mention. Several years ago I did with pistachios, but no longer. There used to be a generic alternative for the Kashi GO LEAN but I can’t find it. If you know of one, please, clue me in! 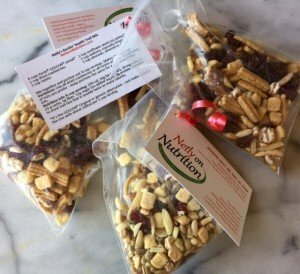 2 Responses to Neily’s Rockin’ Health Trail Mix – You’ll love it! Very tasty but I couldn’t find salted sesame seeds. I salted them myself. I might trade off half the sesame seeds next time for pepitas. Packaged up and ready for next week. Hi Erika – Oh my goodness I’m so glad you posted this! I never realized I had sesame seeds when I meant sunflower. I’m changing the recipe to read correctly. Thank you! ?